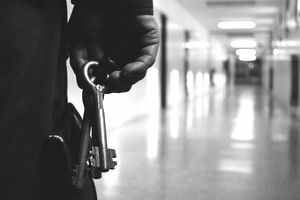 What Qualifications Does a Prison Warden Need? Prison wardens ensure that prisons operate efficiently, safely and securely. They oversee all staff in a prison monitoring that applicable laws, rules, standards, and facility-specific policies are followed. They are employed in all levels of government and the private sector. They work in the Bureau of Prisons within the US Department of Justice, state prisons and private prisons that contract with states. City and county governments operate jails. Jail wardens do the same job as prison wardens, but the facilities have different populations. Jails hold people serving short sentences and those awaiting trial. Prisons house inmates with lengthier sentences. In their daily work, prison wardens see people who are in the lowest times of their lives. Many inmates do not rehabilitate, and it can be frustrating for wardens to see people come back to prisons again and again. However, some people come to prison once, get their behavior under control and leave to lead productive lives; and this can be rewarding for prison wardens. Wardens are hired through the normal government hiring process. Because individuals in these positions have direct access to inmates, employers conduct criminal history and background checks. Felonies disqualify individuals from employment. Finalists are often asked to submit to drug testing before a job offer is extended. Because the position has such a high level of responsibility and because the warden’s supervisor does not have an office at the prison, panel interviews are often used in the hiring process. This type of interview helps hiring managers to mitigate the impact of any biases they may have. Hiring managers must be able to trust new hires, but they do not want to misplace that trust. Panel members provide their input on who should be hired, but the ultimate decision remains with the hiring manager. Employers usually require candidates for prison warden positions to hold a bachelor’s degree, preferably in criminal justice. Additionally, candidates are required to have extensive experience in corrections. This experience must include time as a supervisor, ideally with increased responsibility in several positions. For many who hold a prison warden position, it is the last job they hold before retirement. Wardens are seasoned professionals who have proven their knowledge, skills, and abilities over a long career. To gain and keep the respect of their staffs, wardens must demonstrate good leadership and deep knowledge of the criminal justice field. Wardens supervise all prison staff. Staff members include correctional officers, health care professionals, counselors, maintenance staff and custodial staff. Prisons rarely house both adult and juvenile offenders, and even if they do, those two populations maintain physical distance between each other. Wardens who administer juvenile prisons manage juvenile correctional officers instead of correctional officers for adults. A warden determines staffing needs and allocates available staff according to those needs. When needs are not met by available resources, a warden prioritizes which staffing functions must be covered, which can be partially covered and which can be foregone for a period of time. When resources are strained, wardens advocate for more resources with their managers. Prisons operate under specific laws, rules, and standards. Wardens ensure compliance. Facility-specific policies and procedures are approved by the warden. These policies and procedures must not conflict with the laws, rules, and standards that govern how prisons operate. For staff to adhere to the laws, rules, standards, policies, and procedures set for them, they must be trained on them. Wardens ensure staff are properly trained. They usually delegate this responsibility to someone on their staff. Wardens ask for routine data reports on training activity including delinquency on mandated recurring training. When it is alleged that a staff member acted inappropriately, the warden either investigates the situation or appoints someone else who does. Either way, the warden ensures that the investigation is thorough, fair and that the appropriate conclusion is reached. If the staff member is found to have acted inappropriately, the warden decides what personnel actions will be taken against the staff member. Wardens ensure that the facility and security equipment are maintained. Correctional officers rely on properly functioning equipment to keep them safe on the job. Malfunctioning equipment is unacceptable. In the 1994 movie The Shawshank Redemption, Warden Samuel Norton tells inmate Andy Dufresne, “They have only three ways to spend taxpayers’ money for prisons: more walls, more bars, more guards.” The movie was set in the 1940s, 50s, and 60s, and Warden Norton’s quip does not ring true today as it did during the movie’s period. As they did then, prison wardens today manage budgets and monitor expenses. In addition to maintaining the walls, bars, and guards, prison budgets include significant health care, food service, and laundry costs. Even in the safest prisons, emergencies are bound to occur. Security breaches like escapes or riots can happen, and natural or manmade disasters may strike. Prison staff members must keep cool heads when these things happen. Wardens serve as incident commanders in emergency situations. They snap into action to direct resources toward abating the emergency and addressing the aftermath. They do this until they get help from outside the prison from organizations like the National Guard or the Federal Emergency Management Agency. Even when their authority is superseded by a new incident commander, the warden is an integral part of the incident command structure because of the volatile nature of prison populations. Wardens represent prisons to oversight authorities and external entities. Even though the prison may have a public information officer, news reporters may want to interview the warden. Therefore, wardens must polish their public speaking skills. Wardens’ salaries vary greatly across the country. Individuals interested in prison warden positions should look at job postings in their areas. If they are willing to move, they should review postings in their desired geographical areas.